1880s During this period, Chatham Dockyard is extended, and new basins are built to help with the increased ship building and repair activity. The workforce expands, resulting in a need for more housing, and many new houses for dockyard 'maties' are built in this area of North Gillingham. Known as New Brompton, the area is at this time part of the parish of St. Mark, Canterbury Street. 1889 Rev. R. Morris, vicar of St. Mark's, arranges for services to be held on Sunday and Thursday evenings for the people in this area. These services, conducted by a Lay Reader, Mr. John T. Rogers, are held in a small room at 74 Medway Road (the house was demolished many years ago, and the site is now occupied by flats). Lay leadership of new mission initiatives is clearly nothing new! 1890 Mr. Rogers is joined by Rev. Henry Baker, a Mission Priest. Their task is to establish a Mission Church here. From the outset, the Catholic tradition within the Church of England is followed, a practice maintained to this day. 1890 Christmas Day - Holy Communion is celebrated. 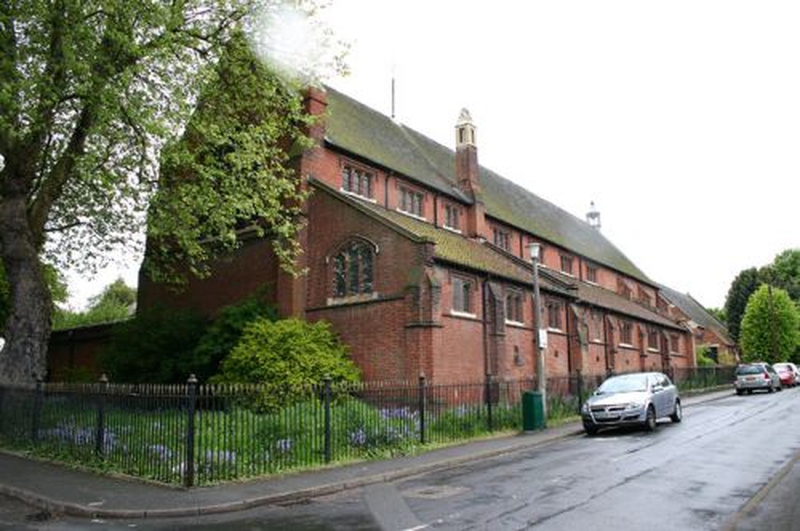 1891 The congregation has now outgrown the small mission room, so larger premises are needed. On 7th June 1891, a large tent (!) is hired for services, and pitched where the present church now stands, at that time open ground. Four months later, the tent blows down, so it's back to the mission room - clearly, a more permanent building is required. 1892 A new Mission Church is dedicated by the Archdeacon of Rochester, and this building (somewhat altered over the years - there is evidence that it must have been laid out so that the altar was at the west end - contrary to the usual practice) is still in use as the church hall. At least two services are held each Sunday, and a choir and Sunday School are established. 1903 By now over 400 children attend the Sunday School, which must have meant having at least two sessions per Sunday. The mission is a success, as far as youngsters are concerned, but one wonders how many of their parents attended church! In April, Fr. William Tozer is appointed priest in charge, and plans are made to build a permanent church. J. E. K. & J. P. Cutts are chosen as architects, and the local firm of West Brothers are to be the contractors. 1908 21st March - building begins, attended by John Harmer, Bishop of Rochester. 9th May - the foundation stone is laid, with great ceremony, and this stone can be seen outside today, set into the east wall of the church in Sidney Road. 1909 3rd February - the new church, costing £3,525, is ready for use, though not quite complete (a temporary west wall is erected, and you can still see the join where work was continued after World War 1!). Not a huge amount of money, even by the standards of those days, but the durable materials, and the simple, but practical design, mean that the building has stoutly withstood the test of time. 1919 The east window in the Lady Chapel is given as a thank-offering for peace by the Guild of Willing Workers, following the end of the Great War. The War Memorial in today's All Souls' Chapel is a chilling reminder of the human cost of this awful conflict..
1920s The west end of the church is completed, but the new architect, W. D. Caroe, makes some changes to the original plans, probably due to the rising ground at that end of the building. The church and the hall (the 1892 mission church) are still not joined, however. The sanctuary at the east end of the church is re-ordered and beautified by the second vicar, Fr. William Lutyens. He calls on the expertise of his famous brother, the architect Sir Edwin Lutyens. The original reredos behind the High Altar is moved, and is adapted to become the memorial to those who died in the Great War. The Blessed Sacrament Chapel is created behind the High Altar (though be it noted that the Sacrament is actually reserved in an aumbry, or wall cupboard, dressed up to resemble a tabernacle). Pictures and images are added to the church at this time, many of which are still to be seen, albeit now sadly in need of cleaning or restoration. The beautiful stone and herring-bone brick of the chancel floor also dates from Fr. Lutyens' time, but, alas, it cannot be said for certain that the design is the work of his brother, Sir Edwin. 1920s-1950s Not much to report, seemingly, as the church cheerfully continues to work in the parish in the 'normal' way. Fortunately, only a few names appear on the Second World War Memorial (a suitably-inscribed Altar Book), as most of the local working men are in a 'reserved occupation' (i.e. at the Naval Dockyard). 1960 A fine wooden statue of St. Luke is commissioned from Oberammergau whilst people from the parish are on a pilgrimage there with their priest, the much-loved Fr. Harry Potts. By the way, the church possesses, and still uses, a beautiful chalice donated in later years in memory of Fr. Potts. 1980s The parish enters a period of major demographic change, as older people move on or pass away. The closure of the Naval Dockyard in 1984 accelerates this process, and the towns of Chatham and Gillingham fall into a decline, which seems never to have been reversed. St. Luke's has a series of parish priests who each stay for only a few years, and two of them abandon the Church of England for the Roman Catholic Church. 1997 The pipe organ is sold because of high repair costs, but in its place the All Souls' Chapel is created, incorporating the War Memorials. An electronic organ is installed, later replaced by the present Johannus Opus 4 instrument now situated in the south aisle. 2007 Following the departure of yet another priest-in-charge, the parish enters a period of great uncertainty, with a tiny, dwindling congregation, and threats of closure. Swift action by the churchwardens and others, together with much prayer, results in something of a minor revival over the next three years, with financial recovery, and slowly growing numbers. The parish itself continues to change dramatically, however, with increasing numbers of houses being converted into accommodation for students at the nearby Universities, built on the site of former Dockyard premises. Many of these students are foreign nationals of other faiths. Great encouragement is given, however, by the re-establishment of good relations with our Scouts, Cubs, and Beavers groups! 2009 Against all odds, the Centenary of the church is celebrated with a well-attended Mass. On Advent Sunday the restored North Porch is dedicated, and re-opened for use, allowing level access from the street to the church once more. 2011 ...and some sadness and disruption is caused yet again by the departure to the Church of Rome of several disaffected former members.....but there's much to be thankful for, as a few new people arrive, and as finances continue to improve. The Sacraments of Holy Baptism and Holy Communion are faithfully celebrated, in accordance with Our Lord's command, prayer is offered daily, the Word of God is preached, and the Gospel message lived out in the lives of our congregation. 2013-2015 These years see some exciting developments! A new pre-school nursery, the King William Nursery, begins to use the hall each weekday, for which purpose the hall gets a fresh coat of paint, as do the toilets, kitchen, and entrance lobby. New storage and office spaces are created. We establish links with the residents of a new sheltered housing scheme in the parish, Prospect Place, and a monthly Mass is held there for those who can't get out and about easily. Repairs are done to some flat roofing and gutters, and some walls re-painted in the church and hall. New catering-quality kitchen units are installed, making it easier to prepare food for events and small parties. Meanwhile, a monthly Saturday evening Youth Club/'Crafty Church' is begun, attracting children from the surrounding area who do not normally attend church on Sundays, another positive step forward in our engagement with the local community. The hall itself is hired out with increasing frequency for family parties, and so on - a real community resource. All these are lay-led initiatives! 2017 The priest-in-charge retires in February, so the parish enters yet another interregnum. However, new people continue to join our little congregation, even though some only stay for a short time, such is the transient nature nowadays of much of our parish population. Never mind - if we simply provide spiritual refreshment for those 'passing through', that's what we're here for! 2018 A Bishop's Mission Order (BMO) is promulgated, with an Associate Lay Minister appointed to set up a 'Fresh Expression of Church' - 'Reach @ Gillingham Pier' - in the new riverside developments, most (but not all) of which are in our parish. This is an exciting innovation, and we look forward to playing our part, however modest, in this venture. Regular Sunday services - by no means clashing with our own - are now up and running, and the future is bright...especially as a new part-time parish priest has arrived, and hit the ground running....! !